Today's Making A Mark Awards are all about learning about art, how to be a successful artist and the art business. It also introduces a new award for the book with maximum added value written and/or produced by an art blogger and published in the last two years. It's an area which is not limited to artists - and people who are not artists have already won awards in this section in the three years they have been running. 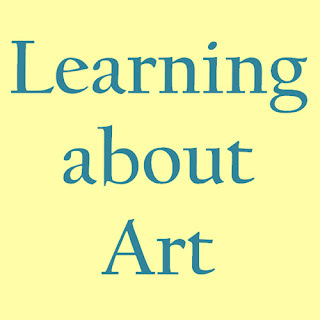 I value blogs which share good information about anything relating to art including what they have learned with others. Anybody who makes me think and offers insights which are transferable to the activity and business of being an artist is eligible for this award. The author MUST be somebody who blogs about art - but they don't have to be an artist. book MUST have been published in the previous two years ie after 1st January 2008 in the case of the award for 2009. This is to avoid any bias towards books published in the early part of this year which have had time to build a following. What I'm looking for is the book which does NOT follow the conventional recipe used of late for a lot of art books produced by traditional publishers. At the beginning of the year it became very apparent in a series of posts I did in January 2009 (see links at the end of this post) that many of us are getting very tired of this. I'm certainly not the only one who is feeling very jaded by seeing art books in the shops which are both lean on content and padded out with the perennial sections on art materials and colour wheels at the beginning. The conventional wisdom on this blog is that we want a LOT MORE from our art books - and this award is my way of creating a way in which we can signal to the art publishers what sort of books we like! A "blue ribbon book" will have a structure, content and design which speaks of the passion and priorities of the artist blogger who has written it (ie "identikit books" will NOT win this award!). Given the ease with which artists authors can now pursue a self-publishing venture, the blue ribbon book may also have been produced and marketed by the artist blogger. However published, it emphatically MUST add value as opposed to being more of the 'same old, same old'. or just nice to look at. I'm going to be writing reviews of a couple of books (on Making A Mark Reviews) I think are worth serious consideration before the 24th December. Tomorrow is the last post in this series of posts inviting nominations for the Making A Mark awards. Many thanks to all those who have already nominated for the awards already identified - it's getting VERY interesting! You can take a look at these by clicking any of the links below. What sort of art book is missing from our bookshelves? Categories art, art blogs, art books, Art Business and Marketing, art education, Art Process, making a mark, Making A Mark Awards, who's made a mark this year? I nominate "Painting Perceptions for the "Make me think Gong": perhaps it doesn't exactly fit into the category but is a very good blog. Larry Groff presents a diverse selection of painters and various interviews. Every time I see a new post I am sure it is going to be an interesting and pleasant discovery. I'd like to nominate Lynne Chapman's blog 'An Illustrators Life for me' for The Really Made me think gong. During this year Lynne took us on a fantastic journey as she created the artwork for 'The bears on the stairs'. Her posts gave a wonderful insight into the trial and triumphs of an illustrator's working life and certainly gave me plenty to think about. For the Really Useful category I'd like to nominate Vivien Blackburn's blog 'Painting Prints and Stuff. This blog has been a real treasure trove of information, ideas and inspiration for me during 2009. Vivien's posts often preempt my questions with clear explanations of her creative processes and techniques. The student demos she shares and challenges she sets are also extremely helpful learning aids. I nominate Creativity Journey http://myrnawacknov.blogspot.com/for the Make me Think Gong. Myrna Wacknov's continual experimentation with techniques, media and supports makes me think, makes me say 'oh wow' out loud and makes me push myself as an artist into unknown territory. I've only read one book by a blogger this year, 'Imaginative Realism' by James Gurney. It was excellent however and gets my nomination for 'The Best Book by an Art Blogger Blue Ribbon'. I would like you to consider cowartandmore.blogspot.com The blog writes about the artists on the website www.cowartandmore.com and gives the "behind the scenes" perspective to their art. It also includes other art websites of interest and collector tips. I would like to nominate Stanislav Prokopenko for his blog www.stanprokopenko.com/blog . He has a great series of tutorials on how to draw the head from any angle and details on drawing all the features. He has helpful information on growth and resources for newer painters such as setting up a studio, choosing the right light bulb for your studio, and what makes good photo reference. He continually shows his step by step progress on paintings and manages to teach his readers lessons and tips related to his painting. His posts are always informative and I always learn something new. I bought the book this year and saw an immediate improvement in my approach to trees. Martin has such a passion for his favourite subject and so generously shares his skills.